When people envision the “west” a lot of images come to mind: mountains, cowboys, large landscapes. Tallgrass prairies are not often on that list. Mention Kansas and people glaze over or remember it as a place to “drive through” or “fly over”. So, for William Least Heat-Moon to construct a 600+ page book centered on this overlooked state is a work of genius and extreme dedication. But the real kicker is that PrairyErth is about a single county in Kansas, Chase County. The book is broken up into sections following a grid of this sparsely inhabited (by humans) county in what was once one of the largest expanses of tallgrass prairie. Least-Heat Moon traversed the county over several years, mostly on foot. He reached deeply into nooks and crannies sprinkled across the county. He talked to many countians including Native Americans and captured all sorts of stories about what life in the Flint Hills was and is like. At the beginning of each “quad” is a long list of quotes and commentary from an immensely varied source of books and other printed works. These greatly enhance the text and provide a nice list of future reading material. Much has been said about Kansas and its importance as a crossroads to other places as well as home to many: people, animals and plants alike. The book is 30 years old now but offers plenty for today’s reader. Much of the text covers historical events and those he met are now part of that history. Least Heat-Moon is often referred to as a “travel” writer although he is much more than that. His writing covers his travels, yes, but his insight is a large mix of history, naturalism and philosophy. He blends minuscule, obscure details into famous historical events. Sometimes it is a bit much, but the pictures he paints with words definitely will bring you closer to feeling you are observing what he sees. 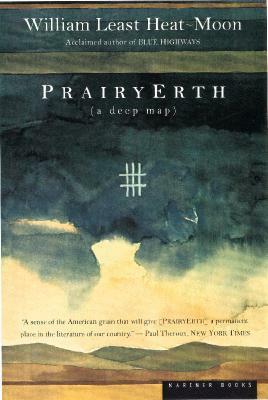 PrairyErth may not be for everyone and is quite different from Blue Highways. But if you are looking for an in-depth, dirtied hands few of what the Flint Hills of Kansas is really like then this is the book for you.